Our company is widely recognized in the field of manufacturing and supply of High pressure Pumps such as Industrial High Pressure Pumps and Industrial Pressure Pumps. In addition to this, these have immaculate finishing and are widely used in various industries. Last but not the least, these plow bolt nuts are the most preferred choice of the clients and these equipments give splendid performance for long period of time. Our ranges of Industrial Pressure Pumps are reciprocating pumps that use a plunger to move media through a cylindrical chamber. Plunger pumps use a cylindrical mechanism to create a reciprocating motion along an axis, which then builds pressure in a cylinder to force fluid through the pump. The pressure in the chamber actuates the valves at both the suction and discharge points. Crank Shaft: Our crankshaft made out of high quality forged hardened material. 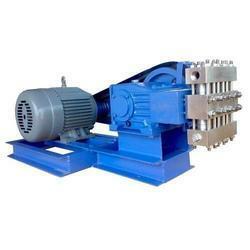 Our company has gained name and fame in the manufacturing and supplying of Industrial Pressure Pumps. Our ranges of industrial pressure pumps are reciprocating pumps that use a plunger to move media through a cylindrical chamber. In these pumps, plungers are made out of high quality Stainless Steel and surface is coated with different types of material. To add on, optional coatings are Ceramic Coating and Hard chrome Coating. Apart from this, these pumps are offered at nominal prices. Our ranges of Industrial High-Pressure Pumps are reciprocating pumps that use a plunger to move media through a cylindrical chamber. Plunger pumps use a cylindrical mechanism to create a reciprocating motion along an axis, which then builds pressure in a cylinder to force fluid through the pump. The pressure in the chamber actuates the valves at both the suction and discharge points. These pumps are used in applications that could range from 70 to 600 bars. 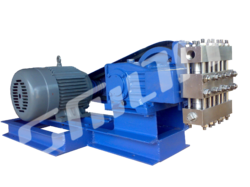 Power End: Power end of the smart pump is manufactured of high quality cast iron. All power ends are splash lubricated for minimum wear & tear. Liquid End: Our liquid end consists of 3 piece block for easy maintenance. A large variety of materials available to choose a right depends upon the purpose and the type of liquid. Material options are SS304, SS304L, SS316, and SS316L. Plunger Packing: Spring loaded packings are used in our pumps for long life and low friction. The packing materials are Rubber Chevron, High-quality Teflon rope.